Paramotor wing collapse: What's the chance of a collapse happening to you? When you first start paramotoring, it's quite easy to end up on the dark side of the internet watching crash videos. A big fear of new pilots is the paramotor wing collapse, and you can find plenty of videos on YouTube to scare you. When I first started flying I was constantly worrying about the wing folding up on me. I basically scared myself watching these videos, without a real understanding of why a collapse happens. When you learn how, and why a paramotor wing collapse happens, you'll soon come to your senses. A paramotor wing collapse certainly can happen, but there is always a cause, which can usually be avoided. So let's look at some causes of the wing collapse, and find out the chance of a collapse happening to you. We'll also look at collapse proof wings, and the best ways you can avoid a collapse. You'll discover the different types of wing collapse, and how to recover from them, and you'll even find out why a wing collapse could actually be a good thing! There's lots of things that can cause a paramotor wing collapse, like bad pilot input, various forms of turbulence, and thermals. These are all avoidable with good training, and good pre-flight decision making. Paragliding pilots are at a higher risk of a collapse, due to the fact that they need stronger conditions to stay airborne. Paramotoring is possible in zero wind, meaning we don't need to put ourselves in dangerous situations just to stay in the air. Paramotoring is considered much safer than paragliding, but pilots with poor, or no training, and pilots making bad decisions, will be at the exact same level of risk. A thermal can hit suddenly and catch you unaware, and can easily collapse a paramotor wing. If you're just starting out in the sport then you really shouldn't be flying in strong mid-day thermals. And since we're flying paramotors, not paragliders, there really isn't any reason to be flying in thermals. Bad input from the pilot can easily cause a wing collapse. This should be covered during training, but still we see lots of pilots making this mistake, and wondering what the heck caused their crash. One common example of bad pilot input would be pulling both brakes excessively. If both brakes are pulled too far, the wing can slow to the point of a stall, the wing will collapse and go parachutal. Nervous pilots pulling on their brakes for a feeling of security are at high risk of this. Passing through wind shear layers, or flying downwind of obstacles (in rotor) can cause a paramotor wing collapse. If you're flying in strong turbulence you should expect a collapse at any moment, again this can largely be avoided on a paramotor. Pilots practising acrobatic flying are at a high risk of wing collapse. If you like the sound of acro, then a SIV course is essential. SIV stands for simulation d’incident en vol, and roughly translated means simulating unstable situations in flight. When I first started messing about with wingovers, I experienced my first small wingtip collapses. This was due to lower pressure on the outside (lightest side) of the wing. This is easily avoided with outside brake pressure, but until it happened I didn't know what to expect from the manoeuvre. Bigger manoeuvres can cause bigger collapses, and this is why a SIV course is essential. You will be talked through each manoeuvre, and you will learn collapse avoidance, and recovery techniques. You will also learn new manoeuvres over water, with support boats ready and waiting to rescue you. So if you come down hard, you're more likely to walk away unhurt. There have been attempts at making collapse proof paragliding wings in the past. But I haven't heard of anyone trying these out with paramotors yet, and there's probably good reason for it. One idea featured an inflatable tube across the wings entire span, similar to the kite surfing wing below. Another used a fully closed leading edge, and six one-way valves across the wing's entire span. These valves kept the wing inflated like a balloon, preventing a deflation. This was a concept wing being developed by Ozone, which showed promising results during tests. There was one flaw though, the wing would stay inverted after a front tuck, as it wouldn't collapse and flip back over. "There is a future here, but it will take me some time to develop it properly to make it super safe." That was back in 2001, so it seems it didn't work, and collapse proof wings won't be available anytime soon. And the next section explains why we may never see them. A wing collapse is actually a good thing! A wing collapse close to the ground can be fatal, but these would normally be avoidable, and caused by pilot error. Again, flying in rough conditions, or bad pilot input would likely be the cause. If a wing collapses at altitude it will usually recover, if the pilot lets it do what it's designed to do. Collapsing is a necessary part of the aerodynamic stability of paramotor wings. All aircraft need passive pitch stability, unless they're controlled by a computer. This means after any change in the angle of attack, or a stall, the aircraft will try to return to equilibrium on its own. Airplanes have tails to deal with this, hang gliders have swept wings, washout in the tips, and luff lines. Paramotors have no tail, no sweep, and no washout. This means they need some way to get back to equilibrium after experiencing a negative angle of attack. 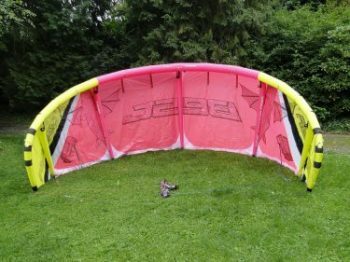 When a paramotor wing goes into a negative angle of attack it collapses, then it slows down because of extra drag, and returns more or less overhead. When it re-inflates and returns to the correct shape, it's back in equilibrium. If the wing didn't collapse it could keep surging forward until all of the lines go slack. The pilot could fall into the wing ending up gift wrapped, or the shock load of re-inflation could break the lines. Champion paragliding pilot Bruce Goldsmith has spoken on this, and agrees that collapsing is actually a good thing. He says that if something stops a wing collapsing (inflated tube, valved inlets etc), then the still inflated wing will instead do something much more violent, and potentially lethal; like tumbling for example. What if you experience a paramotor wing collapse at altitude? As previously mentioned, a wing will usually recover from a collapse providing there is enough altitude. 99% of collapses can, and should be prevented, but if it does happen, there are things you can do to help the wing recover. Even if you don't plan on flying in strong turbulence, you should get to know the different types of collapse that you may encounter. This will help you choose the correct recovery method, in the unlikely event that it does actually happen. I mentioned earlier that pilots who aimlessly pull on both brakes will be at risk of stalling their wing. If this happens the wing will go parachutal, hence the name parachutal stall. This could also be caused by flying too slowly in thermic conditions, or flying in strong gusty conditions. If this happens close to the ground, there will be very little chance of recovery. As the brakes are released, the wing will dive forwards in order to regain its vital airspeed. With plenty of altitude the wing will recover. If the brakes aren't released this could lead to a full collapse, or a spin. To avoid this, you should never pull both brakes unnecessarily, your wing needs the airspeed to keep flying. Remember to always keep your hands up and let the wing fly. Pilots should also avoid flying in strong thermals and gusty conditions, as this can cause extremely high angles of attack, which can stall the wing. 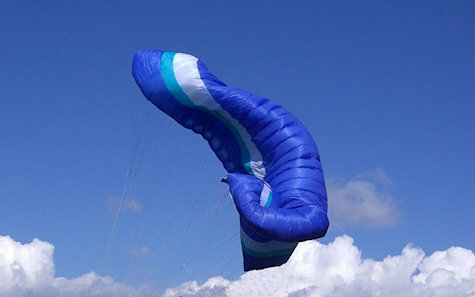 A paramotor wing flies in symmetrical balance, if an imaginary line is drawn through the centre of the wing, both sides are exactly the same. Asymmetrical balance means the two sides are not identical, and differ from one another. This is where the term asymmetric collapse comes from, one side of the wing will collapse and tuck. The tucked wing creates drag, inducing a turn, and a possible dive. You'd normally weight shift to the flying side and counter steer to recover from this, but very fine brake input is needed. If the pilot counter steers too heavily, there will be a risk of stalling the entire wing. But you need to act fast, as there's a possibility that the wing could enter a steep spiral dive. A frontal collapse is when the leading edge tucks underneath the rest of the wing, this results in an immediate loss of lift. This could happen when exiting thermals, or when flying in strong turbulence, or rotor (downwind of obstacles). As the pilot’s momentum continues forward, the wing will pitch backwards because of the increased drag from the tuck. This puts tension on the rear lines, and increases the angle of attack of the wing. The wing will quickly re-inflate, but it will need to regain airspeed, so will enter a steep dive. Most wings will re-inflate very quickly after a frontal collapse. You should give a short, but very sharp pump on both brakes the moment you feel the tuck happen. This will force trapped air inside the wing from the rear to the leading edge, helping to reopen the cells. Be careful not to pump to hard, or too long on the brakes, as you can cause the wing to stall. If the pump doesn't re-inflate the wing, wait until you swing back underneath the wing before pulling a strong, deep pump on the brakes for about two seconds. What's the chance of taking a wing collapse while paramotoring? Modern reflex paramotor wings are very collapse resistant, not collapse proof, just very resistant. Pilots flying in rough or thermic conditions, or pilots practising acro are still at high risk of a collapse. If you fly in calm conditions, avoiding rotor and mid day thermals, the chance of paramotor wing collapse will be very low. 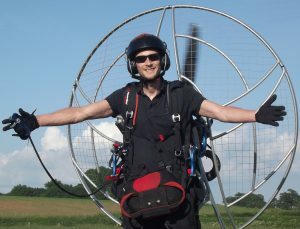 Many pilots will fly paramotors for thousands of hours, and never experience a single collapse. Speak to these pilots and you will discover that they never fly in strong wind, or thermic conditions. As I mentioned earlier, there really isn't any need to be flying a paramotor in rough conditions. If you're worried, wait until the thermals calm down in the evening, or fly before they pick up in the morning. And choose to fly in low wind speeds, it's actually more fun as you'll be able to fly further, without strong wind holding you back. What if I still want to fly paramotors in rough conditions? If you choose to ignore the advice in this article and fly during rough conditions, there are three things to do. By listing these things, I'm definitely not recommending you go out and fly during the rough stuff. These things won't make a collapse less likely, it's simply to give you a better chance of survival when it all goes wrong. Firstly you must fit a reserve parachute to your paramotor. I actually recommend that you always fly with a reserve regardless of the conditions, just in case. But if you're flying in rough conditions expecting the wing to collapse at any moment it's really a no brainer. Secondly, you should get to know every type of collapse that could happen, and learn how to deal with it. The best way to do this as safely as possible is by taking a SIV course. Although the wing will always react differently when inducing a collapse, rather than letting mother nature throw you around. But it still gets you familiar with recovering a collapsed wing, so you won't be so alarmed when it happens for real. Lastly, always fly with lots of altitude. If a collapse happens at 30 feet, it's unlikely the wing will recover in time before you hit the ground. And at low altitudes a reserve will be useless, as it simply wont open in time. Takeoff and landings will be risky business, stay well away from any obstacles and hills that could cause turbulence. Rotor turbulence has been known to knock Boeing 747 jets out of the sky, as you can read about HERE. So you could imagine what it would do to a paramotor, be mindful of turbulence at all times. Paramotoring can be very safe, but bad decisions can make things go bad very quickly. Although a paramotor wing collapse may be scary to new pilots, they are largely avoidable. If you're flying in calm conditions, it's unlikely a modern reflex wing will ever collapse. And if it does, it's likely that it will pop straight back out and return to level flight without incident, and usually before you even notice the collapse. Remember, wings are tested on how quick they recover from collapses before they go on sale. An EN-A rated wing will be the safest wing available to new pilots, and will offer excellent collapse resistance and recovery. Check out my other article to find out whether paramotoring is as safe as everybody is telling you, and for more paramotoring safety tips HERE. I hope you've enjoyed learning all about the paramotor wing collapse. Let me know if you've ever experienced a collapse while paramotoring, and what caused it. If the cause is not already mentioned here, I'd love to add it to this article to help others to fly safer! 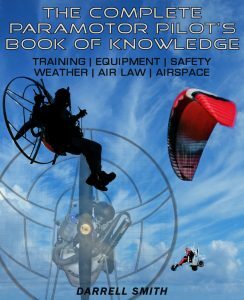 Now you've learned all about wing collapses you'll want to find out about the most common accident in paramotoring. This accident can be avoided, but it keeps happening over and over, read more HERE. Unfortunately, what goes up must come down, including paramotors. One reason to come down is the *appearance* of turbulence. In this situation, it’s not possible to simply “stop flying”. At the very least, one has to descend and land. So this is the issue: When you are committed to a turbulent, low-ish speed, low altitude maunver from which no recovery is possible, and add to that the potential that you are descending into some amount of rotor… *now what*? You’ve already determined you must land… saying “don’t fly in these conditions” doesn’t cut it. “Don’t fly low” doesn’t either. We need to discuss procedures to provide the highest confidence they will stay inflated… and/or procedures to make a “collapse on landing” as survivable as possible. Likely this includes arms up flight… and no sharp turns… but what else? Concerns both free flight and power. There is a lot of good advice, writings, circulars and SIV’s to limit dangers pilots face up in the air. They are commendable efforts. Yet, in the moments of stress, using raisers suggesting one should have PhD to operate, mistakes are bound to happen. In towing, wing designers fail miserably to incorporate a device which will maintain safe AoA during the entire tow sequence. It is very easy, just ask and do not underestimate other people. Technologies reasonably developed, combined with superior control mechanism will nearly eliminate possibility of collapse and make recovery quick. Unless one chooses to fly in catastrophic weather conditions. Unfortunately, authorities prefer issuing advisories nobody reads to physical devices which work autonomously, overriding pilots’ of winch operators’ errors. With extreme luck, somebody will inquire about available I.P. I am not trying to put down all other attempts at saving lives and making the sprt enjoyable instead of flying with hair standing on ends. asymmetric collapses, this is old school way of handling a collapse. You should weight shift to the flying side and brake on the flying side but not too much or the wing will stall. It is easier to stall a collapsed wing. The wing will recover in seconds depending on the class of the wing. I try and keep the glider flying straight or slightly away from any obstacle during this recovery. There is another better way of recovery by using the energy of the collapsed wing to aid recovery but that is only for the higher classes of wing and only after SIV.